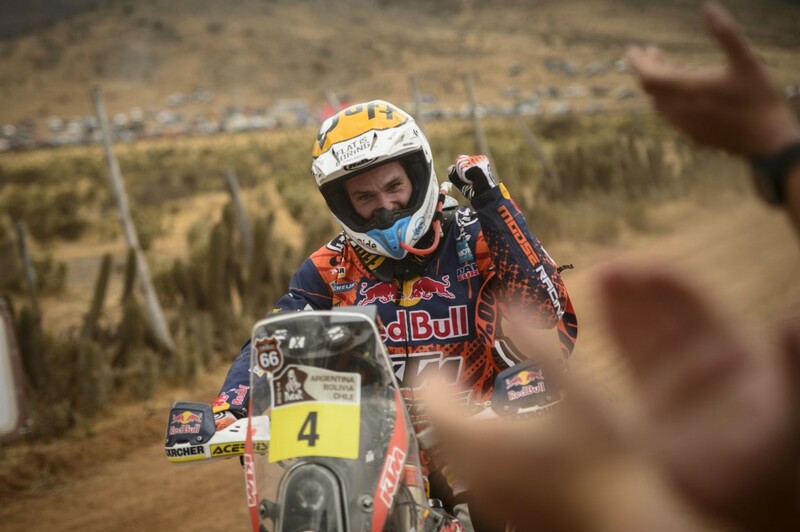 Only three days ago, the Dakar 2014 finished in South America, one of the toughst rallies for a long time. 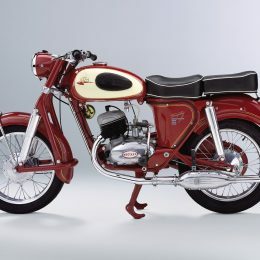 Only 78 of the originally 196 riders in the bike category reached the final thirteenth stage. After covering almost 9,000 km, Marc Coma and Jordi Viladoms of the Red Bull KTM Rally Factory Team stand on top of the podium in Valparaíso. The world´s toughest rally began with a 180 kilometres stage in Argentina. 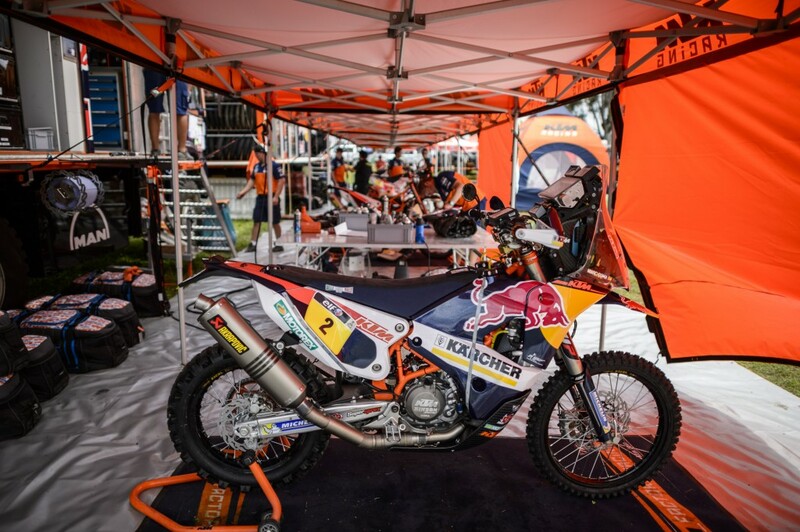 Both the Red Bull KTM Factory riders and the KTM-supported riders performed pretty well on the challenging stage. Above all the three-time Dakar winner Marc Coma (picture), who finished second in the stage only 37 seconds behind the winner Joan Barreda. The riders continued their journey through the diverse landscape of Argentina. First they had to manage the fastest offorad section of this year´s rally, before they reached the grey sand dunes of Nihuil. Chaleco López (picture) finished second in the stage and is also second in the overall standings. Ruben Faria was fourth in the stage and is sixth overall. 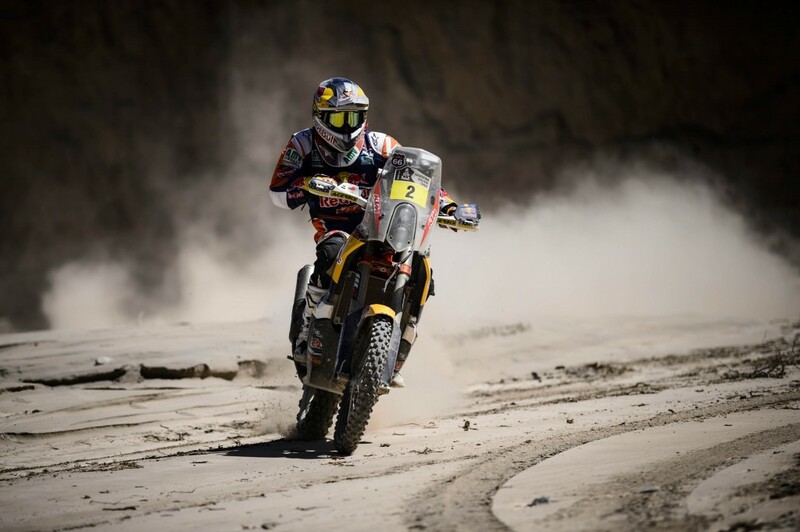 After some technical problems Marc Coma still managed to finish ninth in the stage and is fifth overall after two stages. 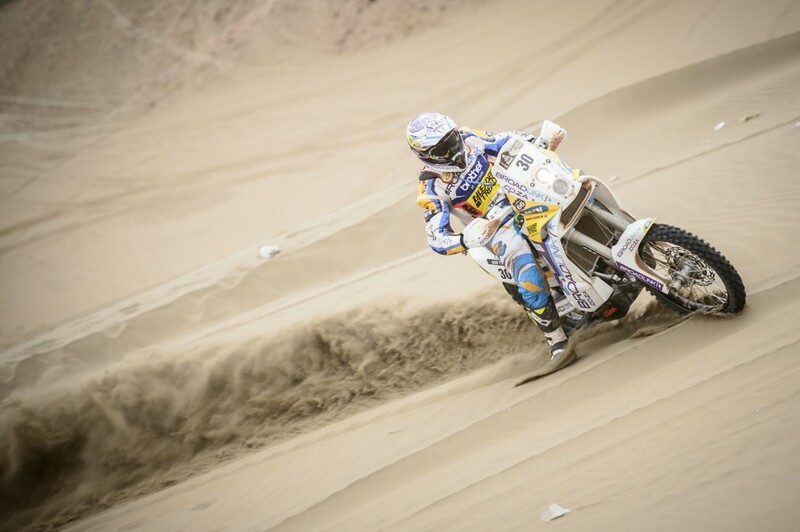 The first part of two marathon stages of this year´s Dakar took the riders into the Andes mountains. They weren´t permitted any outside mechanical assistance. With Marc Coma, David Casteu, Chaleco López, Stefan Svitko and Kuba Przygonski (picture) were five KTM-riders in the top ten. Unfortunalety the stage turned out badly for Ruben Faria. 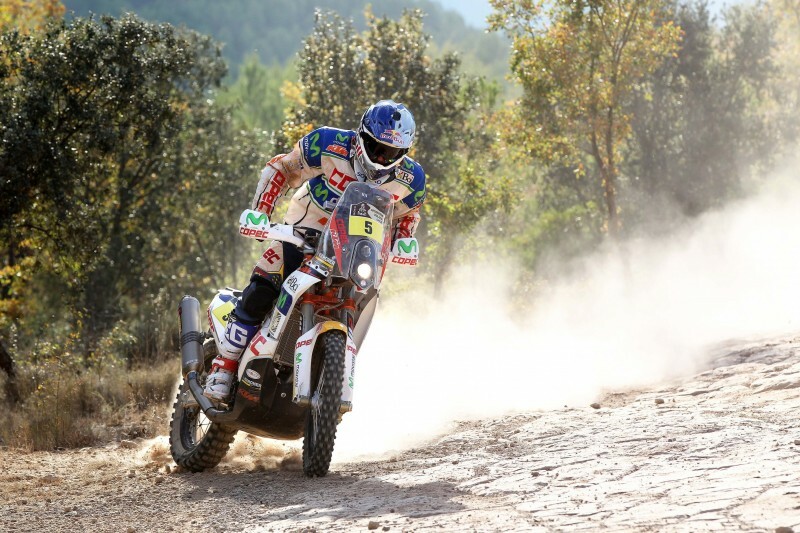 The runner-up of last year´s Dakar crashed and had to withdraw from the race. Like yesterday, the riders had to negotiate their way through the Andes mountains. 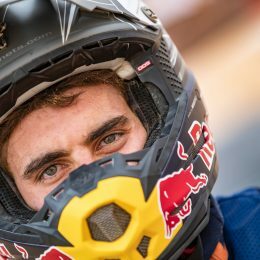 Although the KTM-supported Australian rider Ben Grabham had to withdraw, it was the most successful stage for the Red Bull KTM Factory Team so far: Chaleco López and Marc Coma (picture) finished second and third in the stage and improved in the overall standings. Extremely high temperatures made the fifth stage one of the toughest. As many riders suffered from the heat, the race officials decided to scrap the second part of the stage. Marc Coma gained his first stage victory in this shortened stage in front of his factory teammate Jordi Viladoms (picture). KTM-support rider Riaan van Niekerk had his best day so far and finished fifth in the stage and moved up five places in the overall standings. 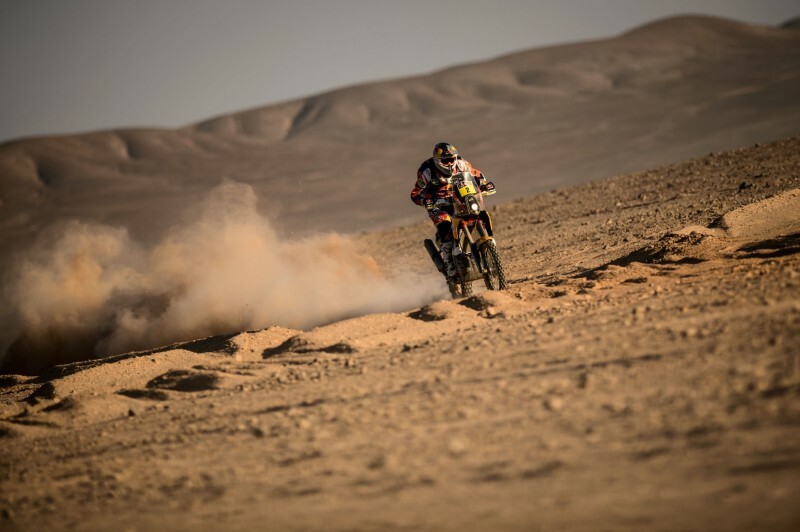 At half way mark of the Dakar 2014 and just before the only but well-deserved rest day for riders and teams, the field had been notably cut down. For Chaleco López it was the end of this year´s rally due wrist and hip injuries he sustained in a crash. Marc Coma (picture) was second in the stage and is 40 minutes in front of Barreda in the overall standings. The first week of the Dakar had been exhausting for everybody. The only rest day within two weeks gave the riders at least some time to relax and assemble their forces for the second week of competition. However, the atmosphere in the KTM bivouac at the foot of the Andes Mountains in Salta was pretty busy. Various obligations were up on the agenda: team activities, preparation of equipment and bike (picture) for the second week as well as press and sponsor obligations. At the half way mark of the Dakar, there are nine KTM riders in the top twenty of the overall standings. 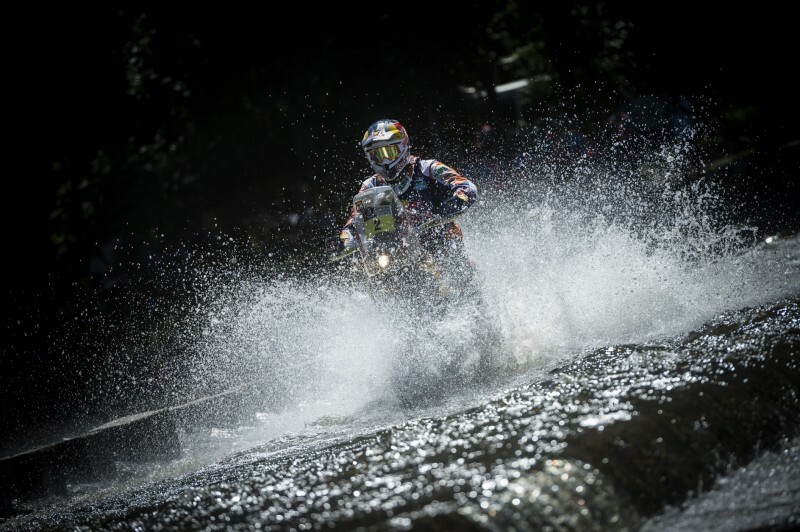 After the rest day the Dakar started in its second week with the next marathon stage. 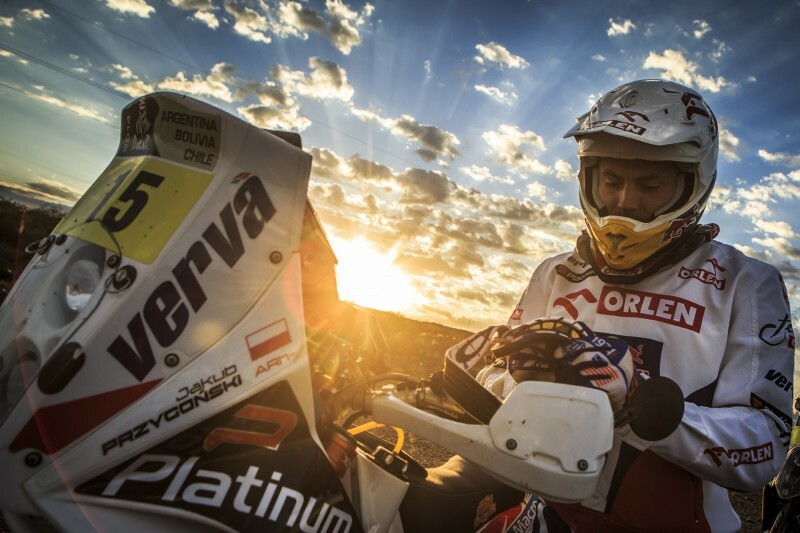 For the first time the riders reached Bolivia. The start of the stage was initially delayed: due to low-lying clouds the helicopters weren´t able to start and the race officials decided to postpone the start. The riders had to negotiate a difficult mountain trail before they reached the famed salt flats of Salar. 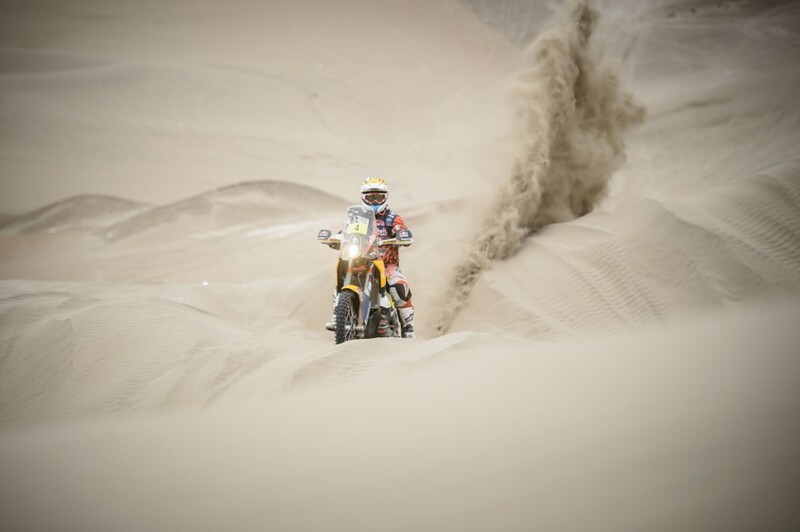 Overall leader Marc Coma as second in the stage. It was also a good day for KTM-supported rider Jakub “Kuba” Przygonski (picture): the pole finished fifth, his best result so far. The second part of the marathon stage took the riders around the salt flat and in the shadow of the Tunupa Volcano with an altitude of 5,300 m. After crossing the Andes cordillera the riders finally entered Chile, the third country this year´s Dakar is going through, and the first dunes of the Atacama Desert. 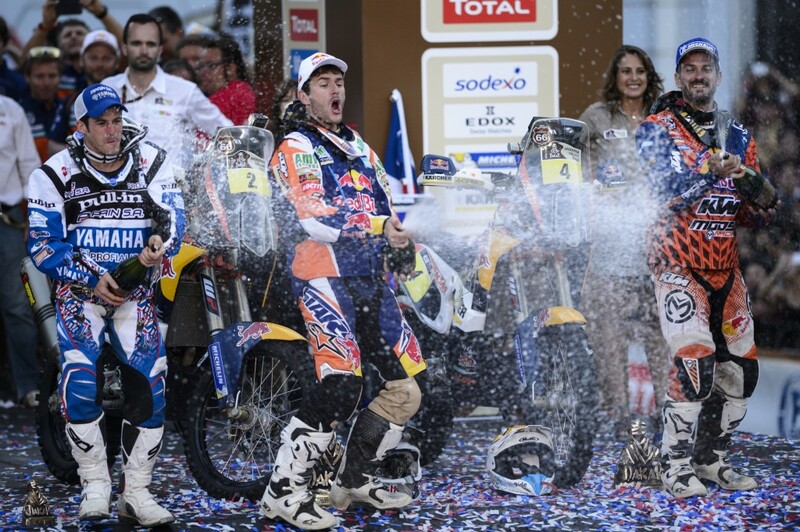 Marc Coma was second in the stage right behind his former teammate Cyril Despres. His best result gained the South African KTM-supported rider Riaan van Niekerk (picture) – he finished seventh in the stage. The first stage in Chile took the riders directly into the Atacama Desert, to the infamous Iquique Dune and finally to the Pacific Ocean. 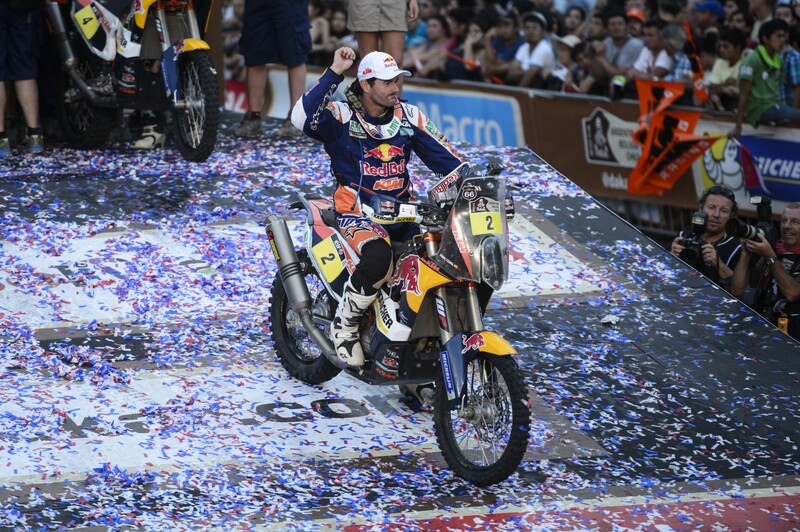 With his second stage win Marc Coma (picture) further extended his overall lead. Despite a crash Przygonski managed to bounce back and finished creditable twelvth. 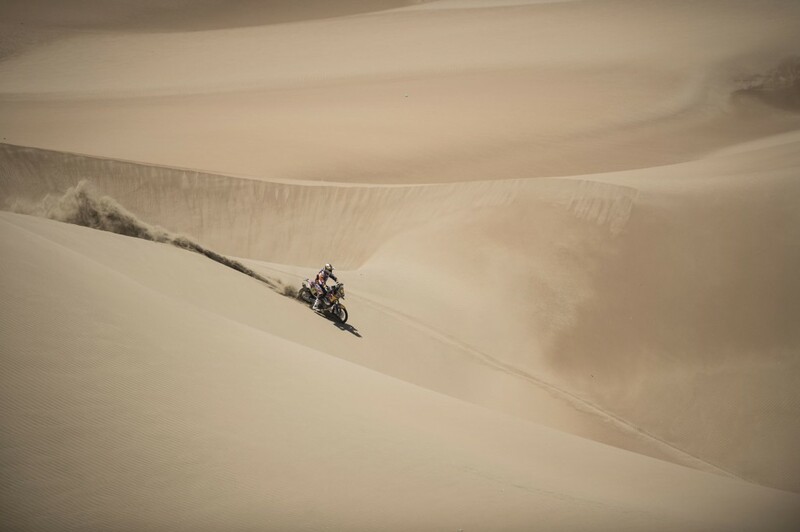 Literally in the middle of the desert, the riders had to cope with the fine and unpredictable sand (“fesh-fesh”). Marc Coma finished fifth in the stage. 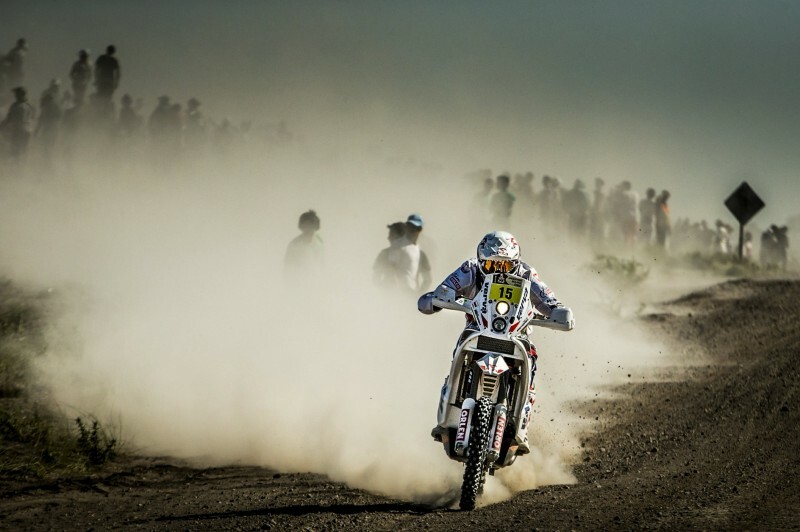 Although he lost some minutes of his advantage, he led with 44 minutes in front of Barreda. Jordi Viladoms (picture) was eleventh in the stage and third overall. 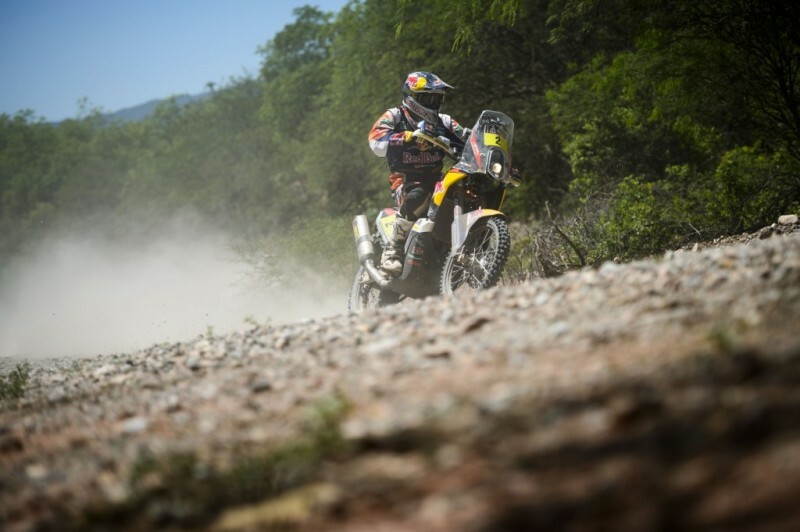 With 605km Stage Eleven included the longest timed special of this year´s Dakar. Even the fastest riders spend up to seven hours in the Atacama Desert. 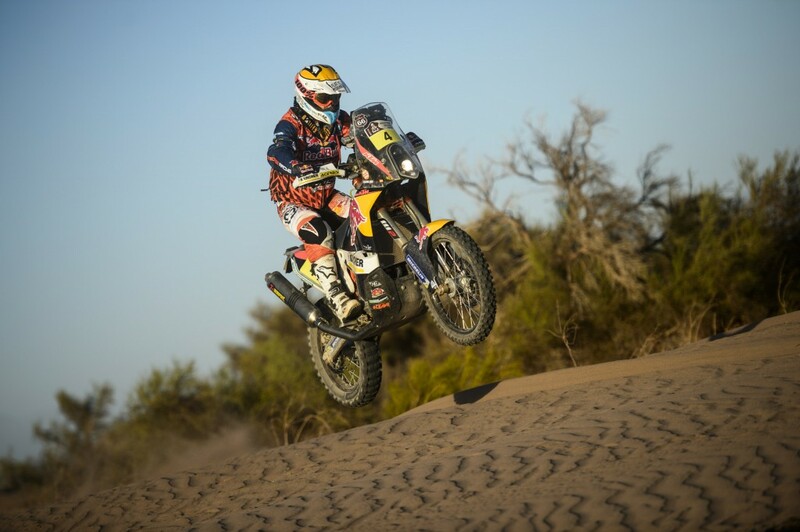 Marc Coma (picture) changed the engine and got a 15 minutes penalty after the end of the stage. Despite the penalty he finished tenth; the penalty did not affect the overall standings. But his teammate Viladoms benefitted from the penalty – he moved up to third place in the stage. The penultimate stage started at high altitude over El Salvador to avoid the morning mist coming in from the Pacific Ocean that has in the past delayed the start of the stage. Short before the finish line of Stage Twelve Coma missed a way point, he had to return and lost some minutes. However, he finished second in the penultimate stage and Jordi Viladoms (picture) completed the top five. With only one stage to go, Coma led with almost two hours in front of teammate Viladoms in the overall standings. Viladoms moved up to second position, as second placed Joan Barreda lost time due to technical issues and dropped down to overall seventh. 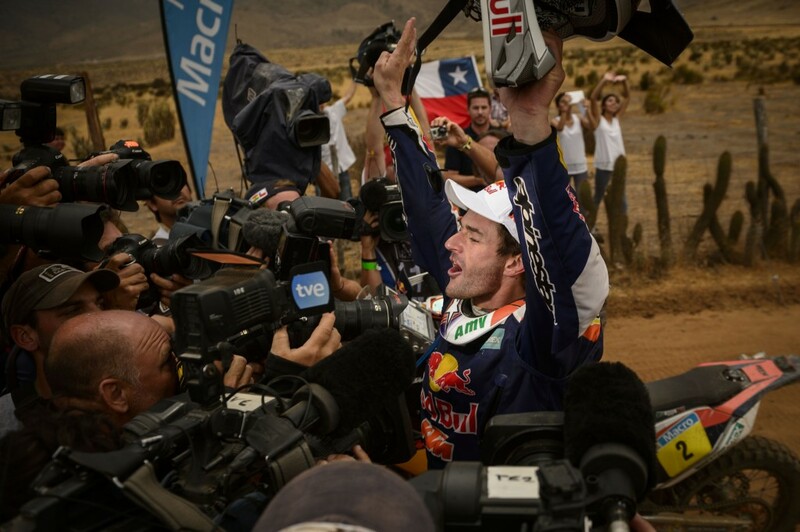 Marc Coma moved one step closer to secure his fourth Dakar title. 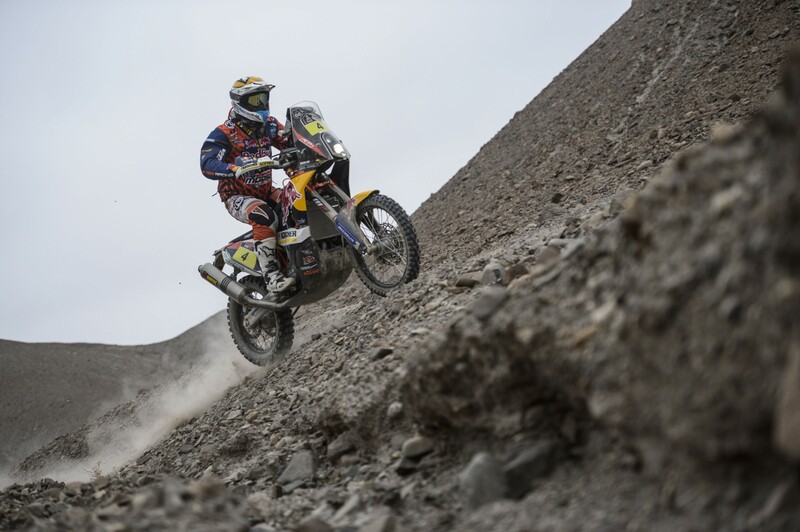 Finishing eighteenth in the last stage, Marc Coma secured his fourth Dakar title and the 13th successive title for KTM in the world´s toughest rally. 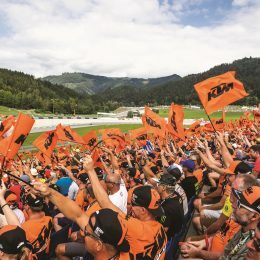 Viladoms finished sixth in the stage and that was enough to give him the second place on the podium and secured the KTM double win. Coma led the overall standings from Stage Five. He completed the thirteen stages, 5,228 km of timed special, in 54 hours 50 minutes and 53 seconds. He gained three stage wins, four second place finishes and three thirds. 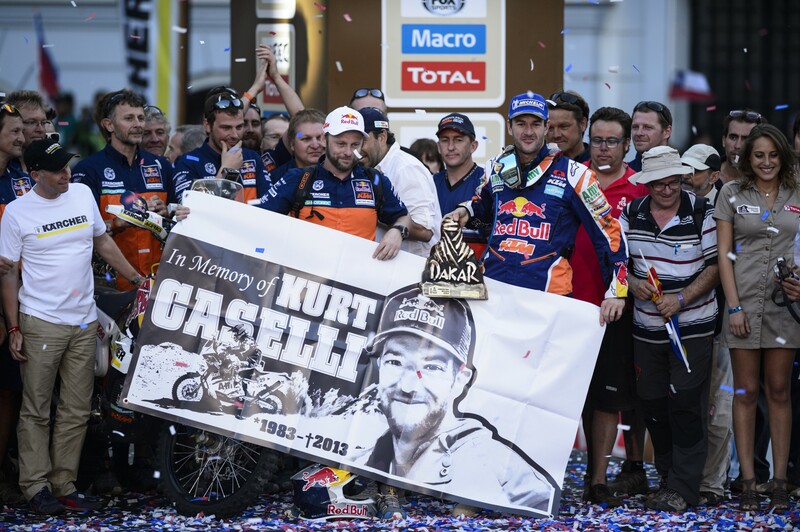 Coma and the whole KTM team dedicated the victory to Kurt Caselli who died in a race accident in November.